So how did a tiny slice of millennials (the 21 students in my “Christianity and Politics” class at Santa Clara University, the Jesuit university in Silicon Valley) respond to Pope Francis’ speech yesterday to the United States Congress—a speech in which the 78-year-old leader of an ancient institution addressed the assembled leadership of an increasingly dysfunctional one? As it turns out, not so badly. First, there were the intangibles the students found appealing or intriguing. Thomas said he appreciated that Pope Francis gave the speech in English, even if it was obviously a challenge for him to have done so. Avery liked the language of “dreams” that ran throughout the speech, uniting its content and evoking a resonant image in the American experience. Judy noted the frequency of the word “care,” as if Francis was reminding us of the thing that really matters in our competitive, consumerist, self-regarding lifestyle. Catherine liked his use of the words “brother” and “sister” for all people: the imagery of family and community abounded. And Francis’ curious use of the pronoun “we” in his discussion of immigration and his own immigrant experience caught the eye of the class. The pronoun stretched the boundaries of the community of American membership—from Washington, D.C., to the pope’s native Argentina and beyond—and offered an inviting way to re-imagine what it means to welcome the stranger. 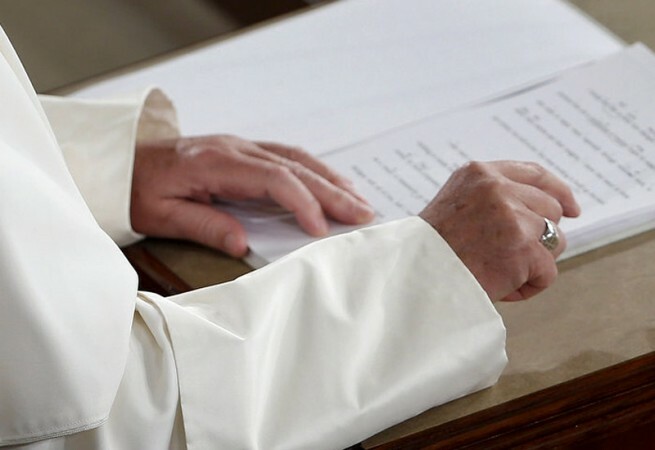 But beyond which issues were discussed, students also took note of two more basic challenges laid down by Francis: How do we understand politics and how do we understand religion? He didn’t speak in sectarian terms but spoke in a language and logic that appealed to all people, Catholic and Christian and otherwise. For a generation that’s only known an increasingly dysfunctional, deeply polarized Congress, the pope’s measured tones seemed almost nonpolitical, Bobby said. And Pope Francis seemed even more nonpolitical when he dwelled in the talk on the reckless, destructive use of categories of good and evil, sinner and righteous in political discourse, Bobby added. In any case, the way Francis approached these matters seemed to raise the question: What’s the purpose of politics anyway? Gregory noted how carefully throughout the talk Pope Francis identified this purpose with service to the common good. Gabriel appreciated the pope’s insistence that the common good not only included the vulnerable but even required us to give them our closest attention. Perhaps one of Francis’ gifts to millennials will be an invitation to think anew of the moral significance of public service in government. Such work in politics is really not a cynical house of cards posing as moral righteousness. But if Francis may have begun a slow rehab of politics for the millennials in my classroom, he appeared to have done even more for religion. Many of them noted that for being a prominent religious leader he didn’t seem very religious at all—and that was a very good thing. He didn’t speak in sectarian terms but spoke in a language and logic that appealed to all people, Catholic and Christian and otherwise. He didn’t stand Kim Davis-like as a lonely sentinel in the face of a hostile world—the all-too familiar model, one student said, of “religion in opposition to someone else.” He didn’t have an air of judgment but stood serene and even joyful—whenever he said the word “dream” he seemed to pause, smile, and savor it—in a conversation with strangers. “It’s not black and white, like my going to mass and hearing a homily that says ‘repent or die,’” Dennis said of the speech. Elizabeth summed things up well. Pope Francis, she said, seemed to “reach beyond the personal boundaries of religion and politics” toward the possibility of genuine community. Of course, these are boundaries in which we are enclosed or enclose ourselves. I sense a Millennial breakout. David DeCosse directs campus ethics programs at Santa Clara University.